As we've mentioned before, Caleb is obsessed with airplanes. He loves to watch them land, take-off, taxi, sit, fly and whatever else they do. He loves toy airplanes and books about airplanes and especially to watch video clips of airplanes on YouTube. I appreciate all the people who stand at airports and take video of the airplanes as they fly in and out and then post these gems on YouTube because I would never have the patience for such an occupation. While in DC we took a trip, our first, to the Steven F. Udvar-Hazy Center a companion facility to the National Air and Space Museum. 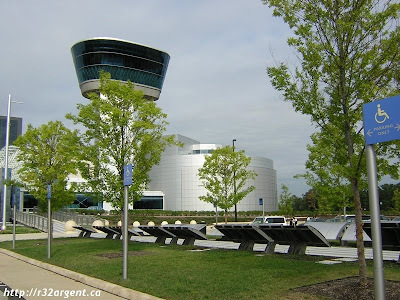 The Udvar-Hazy Center is located in Virginia near the Dulles airport and as we drove, and drove, and drove to get there I couldn't imagine why it was so very far away from the other museums located on the National Mall. Then we arrived and I discovered why this facility is where it is -- the building is ENORMOUS. 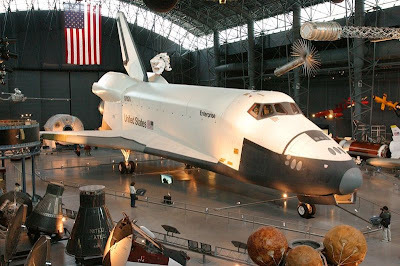 It houses as astonishing collection of aircraft including a Concorde, a prototype of the 707, the Enola Gay and the space shuttle Enterprise -- I'd never seeen a space shuttle up close and it was MASSIVE. 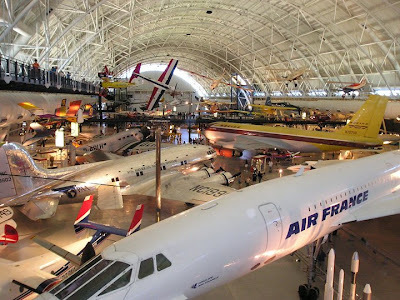 Additionally, there is an IMAX theatre, space simulator rides and a 7 storey observation tower where visitors can watch planes flying in and out of Dulles airport. The center in built inside a hangar and planes are displayed on three levels with catwalks around the entire facility so visitors can view the aircraft from different perspectives. I have no good shots of Caleb because he wouldn't or couldn't stand still long enough to have his picture taken. He was absolutely thrilled with everything. Admission is free and there is a free shuttle that takes you to the museum directly from the National Mall. If you haven't been and live in the area or are planning a trip to DC in the future, this museum is not to be missed. Cute. He's seriously got the biggest grin in every picture. Pure heaven for him. Sigh. I love DC (except the evil traffic). We lived there for 5 years and loved it. Never went to this museum, though, so now I have a reason to return. Looks fantastic! I think you may have a future pilot on your hands! I love it when little boys are soooo into little boy stuff! Cool airplane and all, but that cute baby is getting so fat! Love it. Every little boys heaven! What fun! Sebastian must have picked up his fascination (read: obsession) with airplanes from Caleb. He would probably pass out from joy...it will definitely be on our itinerary for home leave next summer. I love that museum!!!!!! You are making me miss Virginia and the DC area!! I agree with Annemarie..I love it when little boys like things that! I love little boys who love planes. They grow up to be wonderful men (far away, I know, but still.). You put us on your reading list! I'm so happy. All of a sudden I have this little green person that says I have a reader of my blog. Granted people do read them and occasionally leave comments but you actually made the little green man appear. I'll say it again. You have made me very happy. Granted it doesn't take much but that is completely beside the point. That museum is great -- Jacob loved it too. Great pictures! Girl, you get around to so many cool places. Keep posting, I will sight-see through your eyes!